We've just returned home from our two+ week road trip through beautiful British Columbia, Canada and I thought I'd share a few tips I relied on to make family road trips run a little smoother. 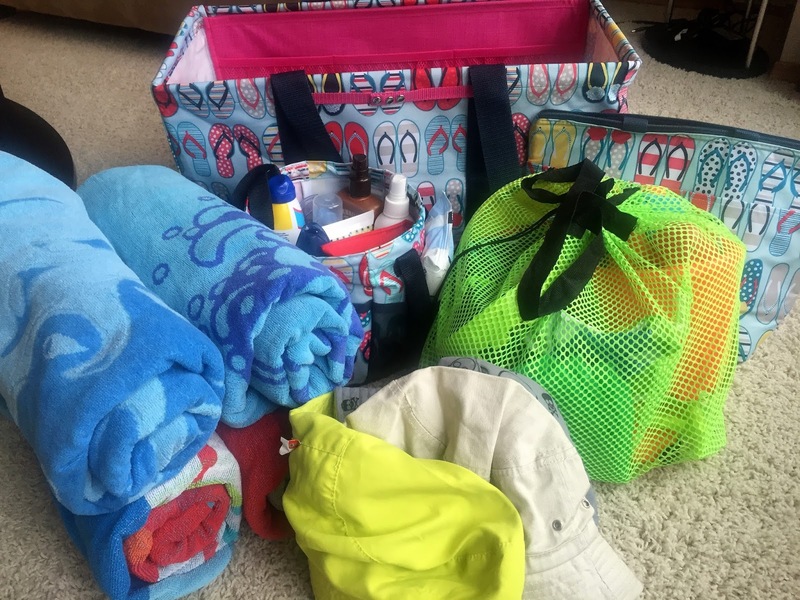 Today I'm talking about how to pack the perfect beach bag. During our road trip we spent a glorious week in Osoyoos B.C., just soaking up the sun and enjoying lake life. 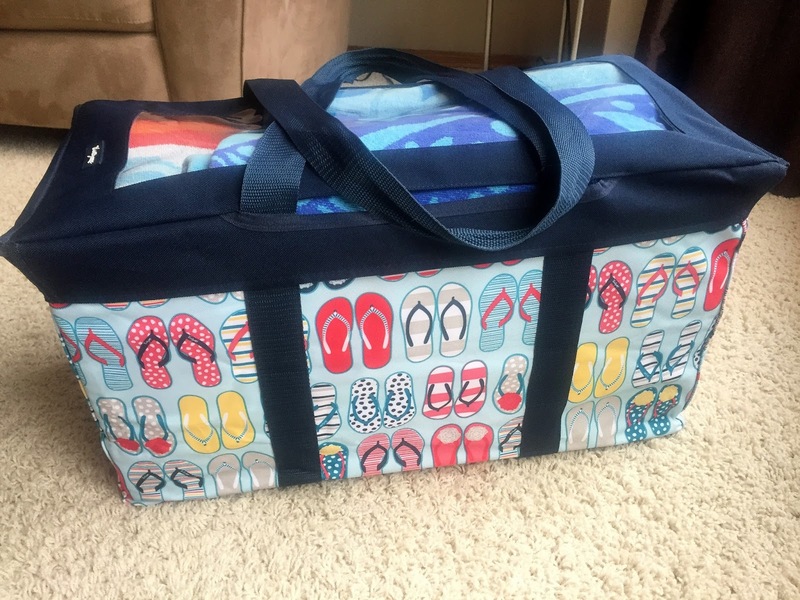 I wanted to make sure we had everything we needed to enjoy our days at the beach, so I chose one bag to pack and dedicate as the beach bag. All we had to do was add a few drinks and snacks, grab the bag and walk down to the beach and we had everything we needed for a fun day. Did I mention the size? 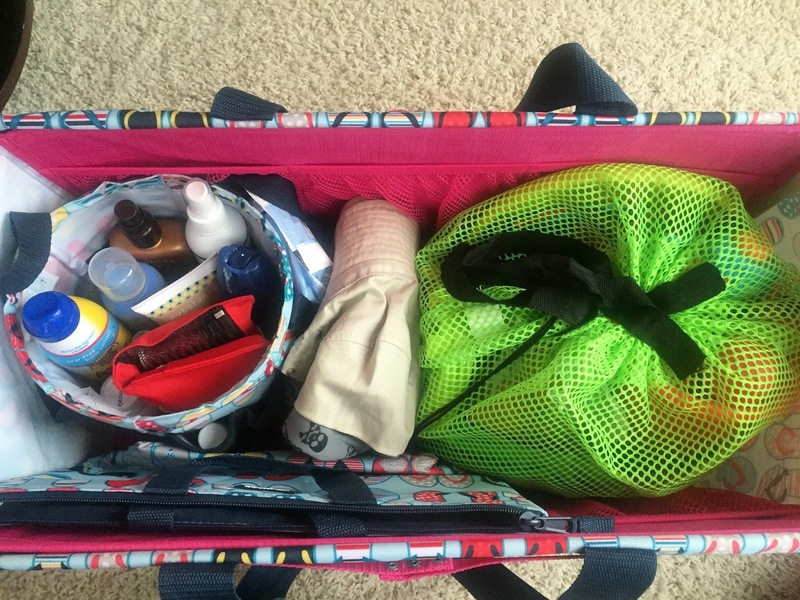 The Large Utility Tote is a generous size without being overly big, and it handles all this stuff! 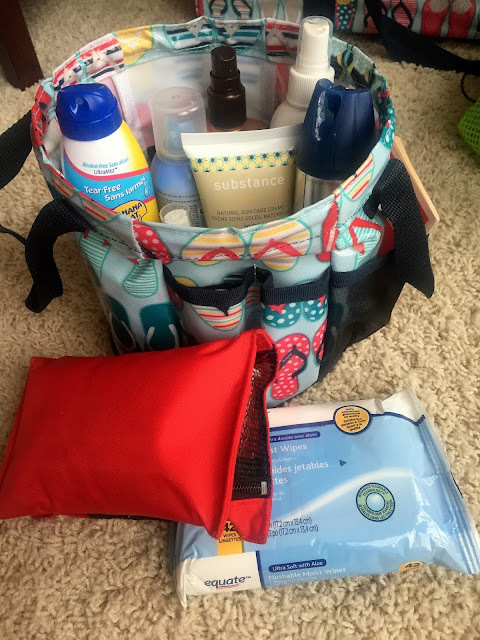 I packed four full size beach towels, sun necessities, hats, beach and water toys and a thermal snack bag into this baby! 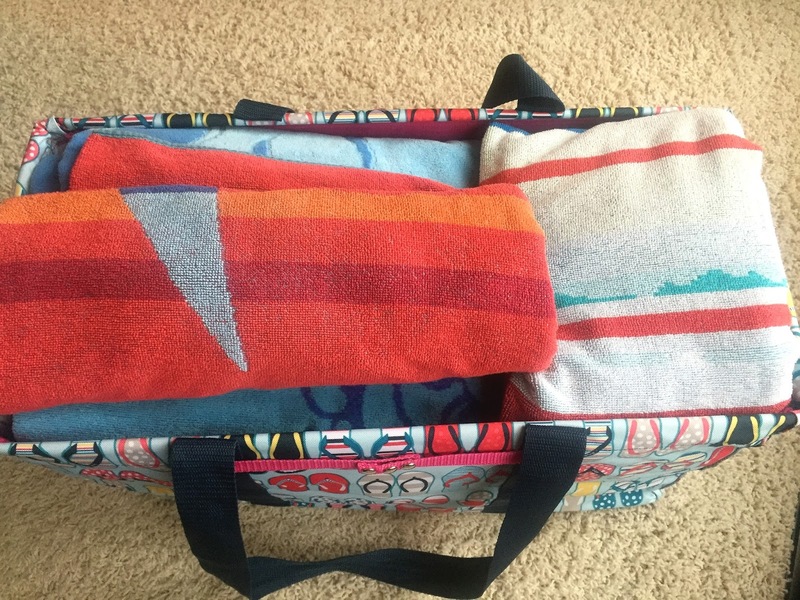 The caddy lives in our main floor bathroom cabinet year round for easy access, and then I just pop it into the beach bag to take with us. Totally portable! I found this great mesh drawstring bag at the Dollar Store to contain all the beach toys, but a mesh laundry bag would work for this purpose too. We've got buckets and sand castle building equipment, a frisbee, water guns, inflatable swim rings and beach balls, goggles and nose plugs and all manner of small toys for tossing around in the pool or lake packed inside there! Again, the mesh is perfect as you can shake out the sand or rinse off the contents and let the entire thing drip dry. I also pack a small empty thermal bag to put snacks and drinks into. 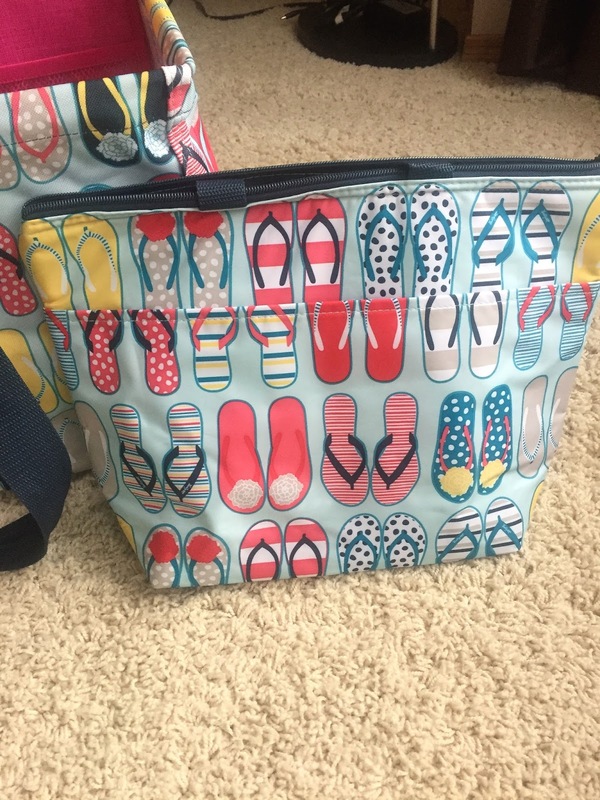 Thirty-One's Thermal Tote lunch bag is the perfect size as it packs flat but will hold several juice boxes or water bottles to keep us hydrated. Packing up the beach bag couldn't be easier - the caddy and the mesh toy bag fit neatly in the bottom of the bag along with the hats and thermal tote. The mesh pockets on the interior wall of the Stand Tall Insert will provide a place to stash phones, a book, ice-cream money or other small items so they don't get lost floating around in the big bag. ...and the Top-A-Tote Lid slides over the handles and fits snugly around the corners of the bag, keeping everything neatly contained. Perfect! and the boy's personalized Cinch Sacs for their toys, books and electronics (which traveled with them in the back seat to keep them occupied! All in all it was a great vacation! Now that we're home I'll be focusing on some back-to-school organizing projects and more scrapbooking and 1-2-3 Layout posts. And, I'll probably start dreaming about where our next Road Trip will be! 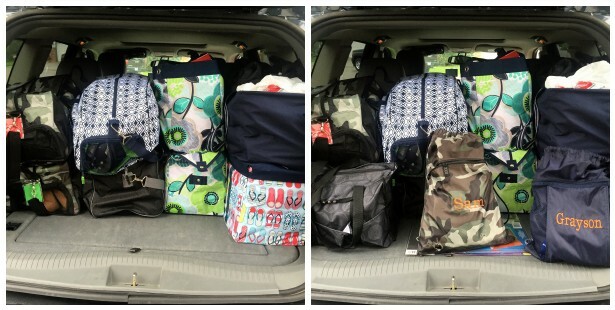 Do you have any tips to share about packing up for a family road trip? I'd love to hear them in the comments below! During a road trip a thermal bag can make your food and other drinks hot and cold. It will make your trip more enjoyable. I always carry thermal lunch box whenever I going out for a trip with my motorbike. Thanks for sharing this post! Keep up the good work.